I know what you're thinking - why are we featuring this poster? Well, there's no good reason besides that it's a new take on the Wizard of Oz, obviously, and features the voice of Glee's Lea Michelle, who I totally love (yep). Dorothy of Oz is a new animated movie being directed by Dan St. Pierre. Dorothy returns to Kansas to find it devastated by the tornado that had whisked her away to Oz. The home she has been so desperate to return to is severely damaged, the townspeople are packing up. But shortly after arriving in Kansas, Dorothy is magically transported back to Oz where she finds out that it's in trouble and the people need her help, too. Thanks to IMPAwards for originally debuting this poster. The screenplay was written by Barry Glasser & Adam Balsam, based on Roger S. Baum's novel, with original songs written by Tift Merritt. The voice cast includes Lea Michele as Dorothy, Dan Aykroyd as the Scarecrow, Patrick Stewart as "Tugg", Hugh Dancy as "Marshall Mallow", James Belushi as The Cowardly Lion, Oliver Platt as Wiser the Owl and Kelsey Grammer as The Tin Man. Quite a cast, eh? 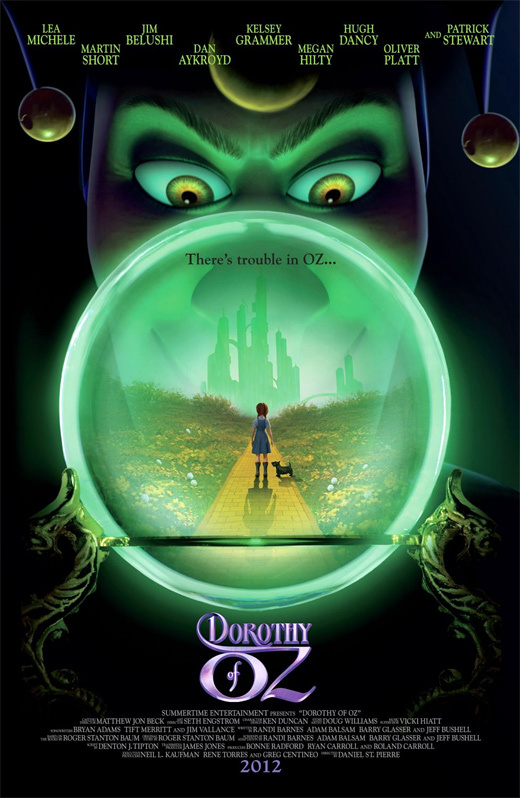 Dorothy of Oz is expected to hit theaters in spring of 2012! For more info, visit the film's official website or check out some early concept art released last year. Sounds Fun! At least its not a remake! Wow this came out of nowhere I hadn't even heard of it. looks good! This poster doesn't tell me anything new that they're bringing to the world of Oz. Poster is a cliche. Doesn't make me want to see it. Where's the trailer? This looks derivative of Disney only not nearly as good. Must be low budget. I heard the digital fx supervisor for this film is one and the same for Happy Feet 2. That does not bode well. Pass. With the Wicked Witch dead, now there's an evil court jester? Nice story - but one factual error: There are FOUR writers for the screenplay, not two. Check the poster itself - Randi Barnes, who wrote the original screenplay, is the first listed writer, and Jeff Bushell also worked on it.